SINGAPORE – Mapletree Investments (“Mapletree”) today unveiled a refurbished 1938 Merryweather Pump Escape Fire Engine (“Merryweather”) as an art piece to more than 70 preschoolers. As part of the launch, each of these preschoolers from MindChamps and Sparkletots Preschool @ Telok Blangah learnt to assemble a three-dimensional (3-D) Fire Engine Cardboard Model. This Model is commissioned by Mapletree and also serves as a multi-purpose stationery holder. In addition, to bolster Mapletree’s outreach efforts in the arts to the wider community, we will give out 400 sets of the 3-D Model to pre-schools located in the vicinity of Mapletree Business City (MBC). Transformed into a public art piece, the Merryweather is a part of MBC series of art installations to bring the arts closer to the communities. Located between 50 MBC and 60 MBC, the Merryweather was built in 1938 by Merryweather & Sons (London) and was acquired by the Singapore Harbour Board (the precursor to the Port of Singapore Authority) in 1946 before it was decommissioned in 1977. Mapletree saw it fitting to restore this old dame as an art piece, showcasing a glimpse of its former glory. In line with our support for the arts, which is one of four key pillars of our corporate social responsibility (CSR) efforts, the refurbished Merryweather will further enhance the vibrancy of MBC’s premises while preserving a part of Singapore’s heritage. 1This is one of two Merryweather fire engines left in Singapore; the other is a Merryweather Fire King on display at the Civil Defence Heritage Gallery at Hill Street. 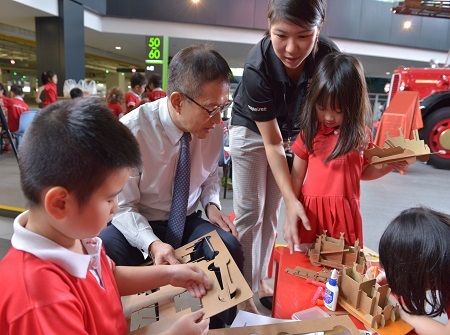 Mr Edmund Cheng, Chairman of Mapletree, assembling a Mapletree-commissioned 3D fire engine cardboard model with students from MindChamps@MBC, at the launch of a Merryweather Fire Engine as an art piece. 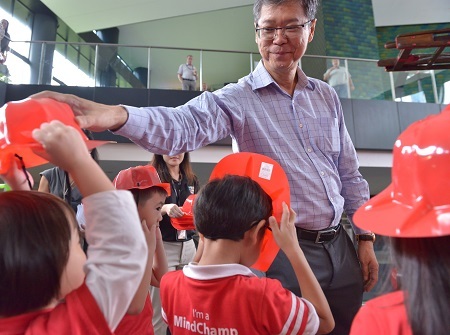 Mr Hiew Yoon Khong, Group Chief Executive Officer of Mapletree, giving out firemen helmets to students from MindChamps@MBC at the launch of a Merryweather Fire Engine as an art piece. Mr Edmund Cheng, Chairman of Mapletree, and Mr Hiew Yoon Khong, Group Chief Executive Officer of Mapletree, officially launching a vintage Merryweather Fire Engine as an art piece at Mapletree Business City. Mapletree is a leading real estate development, investment, capital and property management company headquartered in Singapore. Its strategic focus is to invest in markets and real estate sectors with good growth potential. By combining its key strengths, the Group has established a track record of award-winning projects, and delivers consistent and high returns across real estate asset classes.